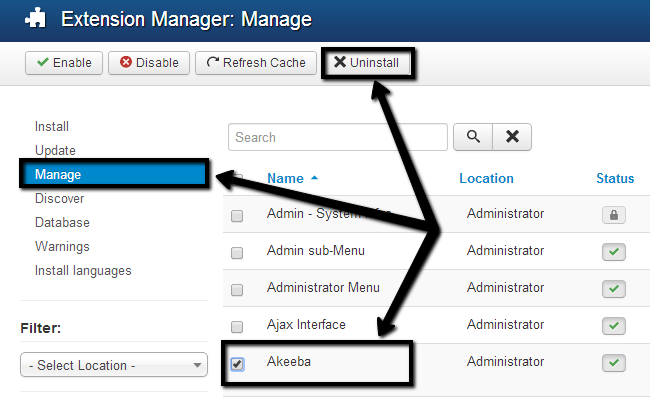 This tutorial reviews how to install or uninstall extensions on your Joomla website. You will get a better understanding about managing the extensions on your website which will take you one step further to a better Joomla website development. For the purpose of this tutorial, we will install the Akeeba backup extension, which is freely available for download via the official website of the product. Log into your website as administrator and navigate to the Extensions on the top menu and then Extension Manager. Upload Package File - This option allows you to install the new extension by uploading it from your personal computer. Install From Directory - This option allows you to install the new extension by specifying a directory on your account that contains it. Install From URL - This option allows you to install the new extension via a direct URL to it. For the purpose of this tutorial, we will use the Upload Package File option for the new installation. Click on Choose File button to select the extension from your local computer. Then click on the Upload & Install button to initiate the process. The installation of the new extension will be completed by the system and you will be presented with a successful message after that. Log into your website as administrator and navigate to Extensions on the top menu and then Extension Manager. Select the Manage tab from the list on the left-side of the screen. Locate the extension that you would like to remove from your website. In our case, this is the Akeeba component. Click on the checkbox next to the extension and then on the Uninstall button at the top. The system will automatically remove the extension from your Joomla website. Once done, you will be presented with a successful message.